St Johnstone have become the club that Geoff Brown set about building. It was 28 years ago when he rescued the Perth club from second last place in Scotland's professional leagues and from a time of financial crisis. Now stable, healthy, ambitious and proud, St Johnstone are a testament to his principles. When the Perth side defeated Aberdeen to reach their first Scottish Cup final in the club's 130-year history, Brown did not immediately reflect back on the challenges that he faced and overcame. They are always there, though, as part of the worth of Brown's achievement. There might be something fitting, too, in the fact that he can enjoy and celebrate them as a supporter, having stepped down as chairman three years ago. It was being a fan of the club that drew Brown to St Johnstone. He guided them from the lower reaches of Scottish football to a new ground - McDiarmid Park - and an established place in the top-flight. Under Brown, the Perth club reached the League Cup final in 1998 and qualified for Europe once. There were also promotion and relegation campaigns, yet since Brown handed over the chairmanship to his son, Steve, three years ago, the club has always finished in the top six, twice qualified for Europe, beaten Rosenborg and now reached the Scottish Cup final. "It's great, I can blame my son for everything as opposed to me getting the blame for everything," Brown laughs about handing over the reins. "I don't interfere at all. I'm one of those ones that, if I'm in then it's four feet in, and if I'm out, I'm out altogether. "I still have an investment in the holding of the club, but as far as running it, he's in charge of that. I'm not even so sure about getting a cup final ticket." He is joking, both about the father/son relationship and St Johnstone's average attendance. The Perth club's following is routinely described as poor or underwhelming. It is often overlooked that, as a percentage of the local population, St Johnstone are well-supported, but Brown and all of the directors during his chairmanship - none of whom were paid - tried any number of initiatives to boost Saints' core crowd. "In fairness, at the start of the season, we played Rosenborg and we had almost 9,000 home fans here," Brown said. "When you're looking at a town the size of Perth, which has 45,000 people, and compare that with Inverness at 78,000 or Paisley with 95,000, our crowds aren't great; but percentage wise they're not too bad. "The directors have done everything within their powers to attract people to the football club. The biggest attraction, though, is good results and this is a great result. Everybody wants to see things won. "The last three years, St Johnstone have made a bit of a rod for their own back; they've been in the top six and people now believe that they should be in the top six, so there's no celebration for getting there. "But we'll live with that. Everyone I've spoken to is going to the game. The number of texts I got [after the semi-final win]… and they were all from people who I thought, 'you should have been at the game'. Perth is not a football town. I just feel that this will bring it alive, though, and hopefully it will be: the last one out, put the lights out." 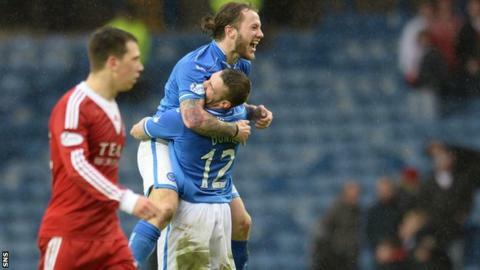 St Johnstone's progress is also a justification of Brown's approach to running the club. During the years in the 1990s that they challenged for promotion to the top-flight, then the years they fought to stay there, Brown saw the likes of Gretna, Livingston, Dundee and Motherwell all spend beyond their means. At times, this held his own club back, but he refused to sacrifice his own values. "I didn't see it as being an unusual stance," he said. "I saw it as being a business stance. Any business has to make sure that they don't spend more than they can earn. "We did that and it certainly cost us promotion the year that Gretna went up and it probably got us relegated the year that we went down rather than three other teams, who all subsequently went into administration. "I would say I was a wee bit bitter at the football authorities, because a severe reaction wasn't taken at the time. Unfortunately, we've got Hearts in this situation and Rangers have hopefully come out of this situation, but in general terms the football in the leagues has been quite good this year." Before Brown took over, St Johnstone were buying players from the junior ranks. Now, they are admired for consistently choosing their managers well, from Owen Coyle through Derek McInnes to Tommy Wright, who guided the team to the 2-1 win over Aberdeen that secured their place in next month's final against Dundee United at Celtic Park. Every decision will now seem vindicated for Brown. He has devoted much of his life to the club, but then he is not alone in that. The reward for all of that commitment is the club's current status - even though there have been losses in each of the past five years, St Johnstone still have money in the bank to consider themselves secure - and now the cup final. "I don't believe that anyone understands the number of volunteers and helpers you get within a football club," Brown said. "We have people like the doorman who turns up for every game and doesn't get paid. There are volunteers in all sectors of the club and they see it as their life. You don't have football clubs without those sorts of people."